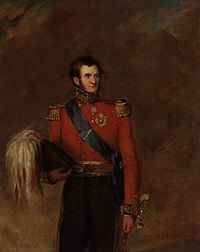 Kerrison was a Lieutenant-Colonel in the 7th Light Dragoons, saw service during the Peninsular War and commanded his regiment at the Battle of Waterloo. Along with Charles Wetherell, he petitioned parliament over electoral malpractice in the parliamentary elections for Shaftesbury, Dorset. Kerrison was the only son of Matthias Kerrison (1742–1827), who was a prosperous merchant and property investor, and his wife, Mary née Barnes. He was born at his father’s property, Hoxne Hall, near Bungay, Suffolk, on 30 July 1776.